How Do You Want Your Morning To Feel? This is the most important tip in my mind. Take a few minutes and think about how you want your mornings to feel. If your mornings are great and peaceful, than awesome! If they are causing you to feel stressed or rushed, think about what things have caused your stress in the past. Personally, I used to feel like a pinball that had been shot out into the day at the mercy of whatever issue or need I bumped into. No sense of control whatsoever! What I didn’t realize was that this was the way I was feeling because I wasn’t leading my day, it was leading me. I discovered that I could change this by thinking about what I wanted the day to feel like and what I needed to do to make that happen, keeping in mind that Andrew was still going to be Andrew with his ceiling fan questions and comments. Oh, the Lessons Unpleasant Experiences Teach Me!! I will be totally honest with you , I am SOOOO not a perfect mother by any means. The tip I share above is purely based on what I learned because of our own unpleasant morning experiences (isn’t that how you learn anything?). This strategy is tied in with one of the most important things that I have learned as a person and parent and while I didn’t learn it until this year, I am so grateful to have learned it because it has made an enormous difference in my life, in my relationship with Andrew and how we move through our days. 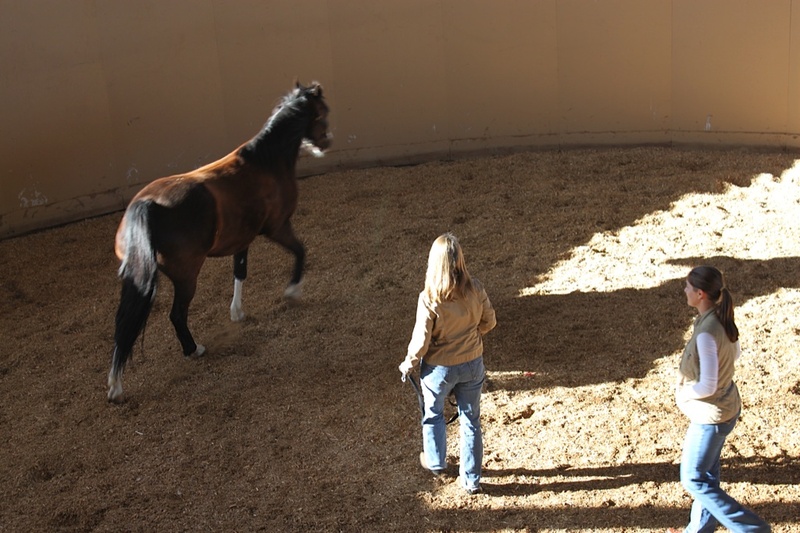 I had an experience working with some horses at a retreat back in March with Dr. Martha Beck (who I am training with to be a Life Coach – details about that coming soon!!) and Koelle Simpson, Master Coach and Horse Whisperer. (Click here to watch them work with Sarah Ferguson, the Duchess of York as part of Finding Sarah on the OWN network.) While the original purpose of the retreat was to build personal leadership skills, the HUGE lesson I walked away with was how my energy, thoughts and feelings have an immediate impact on everything around me because that is what they respond to and this carried over with Andrew. The horses pick up on everything, including any nervousness, anxiety, fear and what they actually want to know is who is leading the herd, essentially who is keeping them safe and fed – just like our children! Getting the horse going in the direction I chose. What is his behavior telling me? What do I need to do to lead the situation? How can I set boundaries to make sure I do not get tangled in his drama? I felt the change in me with the horses but I wasn’t sure how this would actually work with Andrew and all I have to say that it was a crazy experience that proved what I learned. If I was stressed, he became stressed. If I was feeling chaotic and disorganized, he picked up on that and become flustered. If I was relaxed and feeling okay even when things weren’t going smoothly, he was relaxed as well. Amazing! This leads me to my “back to school” tip – How Do I Want the Morning to Feel? First I had to be honest with myself and identify what the problem was, what had been keeping me from having the morning I wanted? I would leave lunch-making and backpack packing until the morning and become distracted with my computer (often putting the final touches on these posts 🙂 ). All of a sudden, I would look at the clock and start running around like a chicken with her head cut off, unable to focus on all of the things that suddenly needed to happen all at once. I would be harping on him to “Get going! We gotta leave in 2 minutes! !” He would dance around, fish lip at me (the face he makes when he is stressed and overwhelmed), follow me around repeating the same thing over and over again and I would loudly remind him (while trying to throw together a lunch he’d eat) that going to school naked was not an option. We always made it but I was usually sweating, anxious about getting there on time and he would pick up on that and worry about getting to school on time. I realized all of the frantic energy I was putting out there during this time. I thought about what was going on during the morning that was causing me to be rushed. I thought about what it would look like if I could have the ideal morning. I then thought about what I could do the night before to make the mornings flow better. For me, it was packing his lunch and having the things that needed to be refrigerated packed and only needing to be placed in the lunchbox. I would make sure his backpack was ready to go with any notes needing to go back to school in his binder. I made sure that my phone, keys and wallet were together and ready to grab. I also realized that it would be helpful to do all that I wanted to do to make the morning feel the way I wanted before getting onto something that was not necessary or could wait. That meant getting us fed and dressed before even opening the computer. If a post didn’t get done by the time I left, I learned that it was okay. If my bed wasn’t made, not a big deal! It became more important to calm down, be more relaxed, take lead of the morning before it led me. This had an amazing effect on all of us and I can honestly state that our mornings are SO much more peaceful than they used to be. If there are times of your day that are stressful for you, I encourage you to think of how you can lead this time (NOTE – I do not say control) with a) how you want that time to feel, b) what you can do to make that happen (even small changes make a huge difference!) and c) keeping your own energy calm to not feed into others drama.